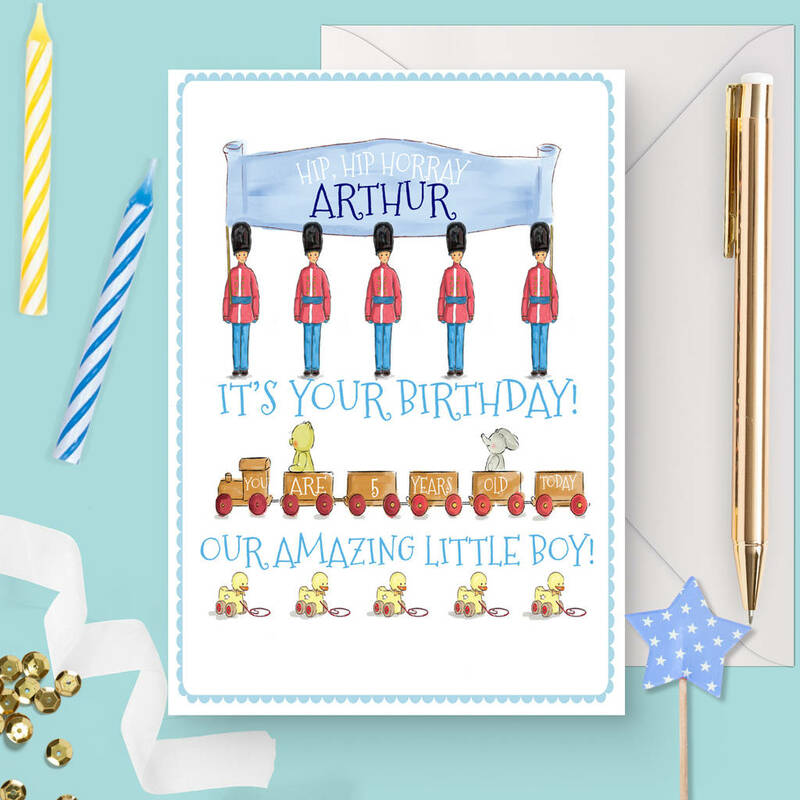 A sweet personalised card for a little boy's birthday illustrated with toy soldiers, animals and a train! Make a special little boy happy with our unique and personalised birthday card range for children. 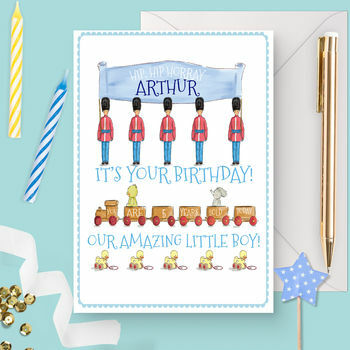 This card has been specially designed for a little boy's birthday and is especially suited for a first, second, third, fourth, fifth, sixth and seventh birthday. This card would make a special keepsake first birthday card for your Son, Grandson, Nephew, Brother, Godson or friend of the family. The cards have been drawn in a timeless, classic and nostalgic style but with a modern twist. We hope the recipient of this card would treasure it for many years to come! You can personalise this card by letting us know the little boy's name and age to be printed on the card when ordering. You can also enter a short message for the front of the card at the bottom for the little boy's if you wish; such "our wonderful Grandson" or "our special son" to make this even more bespoke. We have personally selected the highest quality materials to produce your bespoke card. The card is professionally printed with archival inks, on beautful luxury 300gsm card ,and presented in with an white envelope.